Welcome to a new feature offered by our Environmental Committee! Each month, Sustainability Sam will answer your questions about how you can be more sustainable. Send your questions to SustainabilitySam@tangletown.org for a chance to be featured in an upcoming response. Why is it so important to clear the storm drains in the streets? Tangletown storm drain hero Amelia! Thank you for asking this important question. You may have seen Minneapolis neighbors out chipping away at ice-covered storm drains and clearing away all that winter gunk from the drains to allow the streets to drain as the snow has been melting. These are our storm drain heroes! In addition to keeping storm drains clear of ice, it is important to keep them clear of organic matter–like fallen leaves and grass clippings–and contaminants–such as pet waste, road salt and litter. The storm drains in Tangletown drain into Diamond Lake, Minnehaha Creek, and the Mississippi River (See a map of Tangletown storm drains here). When washed down our storm drains, contaminants pollute the water and the extra organic matter feeds algae and weeds making the water green and soup-like. This blocks sunlight from getting through the water to bottom plants. Without sunlight, these plants are unable to grow and fish and wildlife lose habitat. Adopt a storm drain! Storm drain adoptees keep an eye on nearby storm drains to make sure they’re clear from debris especially before and after storms. Learn more about the Tangletown Adopt A Storm Drain program and our Storm Drain Stencil Contest. And, thank you to our storm drain heroes who have been helping keep our storm drains clean! Thank you to everyone who submitted recycling questions on Nextdoor and Facebook. I am so encouraged by your motivation to recycle right! Below are answers to all of your recycling questions, organized by topic, but first I’d like to start by sharing four important points. Reduce. Metal and glass containers are pretty straightforward when it comes to recycling, but plastics and other packaging can get confusing. Start with how you shop and what you buy. Buy food and products that are package-free or come in packaging that is recyclable. For example, buy the oranges or onions that are unpackaged and loose vs. those pre-packaged in the plastic mesh bag that isn’t recyclable. Buy the sugar in the recyclable paper sack vs. the plastic pouch that isn’t recyclable. How you shop can reduce waste and increase demand for products in recyclable packaging. Recycle right. When you recycle right, it means you are only putting things in your blue cart that can be sorted properly and safely at the materials recycling facility and which can be made into something new. If something is not accepted in your blue cart, it either can’t be sorted by the system in place at the recycling facility or there is no market (buyer) for recycling that item (e.g. #6 plastic like Styrofoam and black plastic). Avoid wish-cycling. “When in doubt, throw it out.” If you can’t determine whether or not something is recyclable, and you are unable to reuse it or donate it, then it is best to put it in your trash. Items put in recycling carts that are not recyclable can damage equipment at recycling facilities, harm employees, and contaminate items that could have otherwise been recycled. 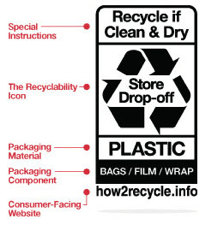 The ‘number in the arrows’ mark on plastics is not a recycling symbol. The numbers (1-7) inside the arrows on the bottom of plastics are resin identification codes created by and used by the plastics industry. They are not the same thing as the recycling symbol with arrows, and do not guarantee a plastic item is recyclable. The City of Minneapolis accepts #1, #2, #4, and #5 plastics in your blue cart. Now, to answer all of your questions and provide resources to help you going forward! Q: What happens to all the labels, tape and plastic packing lists that are attached to cardboard boxes? I would think they contaminate the recycle mixture, or whatever it’s called. I remove it from boxes as much as I can, but I’ve never seen businesses do so, and they produce dumpsters of it every day. A: It is not required that you remove labels, tape, and plastic packing list pouches, although if it’s easy to pull some of it off, go ahead and do so. Please break down all boxes before placing them in your recycling cart. Large boxes can be broken down, bundled (bundles should be less than 3’ x 3’), and placed next to your cart. Q: What’s the Best Way to Recycle Packaging Tape? A: The city of Minneapolis does not recycle packing tape and I am not aware of any drop-off option for recycling tape. Q: I’d like more easily available information on what type plastic bags can be recycled please. Bread bags, newspaper bag, yes. But what about other types? If you buy salad (the sort of “crinkly” plastic material)? Or frozen vegetables in a bag? Or nuts in a bag? The bags with a “zipper”? The bags tortillas come in (or the plastic that some veggies are wrapped in)? A: First, remember that plastic bags should NEVER be placed in your city curbside cart. And, other recyclable items should be loose in your cart and never be inside a plastic bag. Why? Plastic bags get wrapped around the mechanical parts of the machines that sort our recycling. Facilities often spend up to two hours a day shut down so that plastic bags can be cut out of machinery. Plastic cereal box liners (but if it tears like paper, do not include). Many cereal boxes now indicate whether or not the bag is recyclable. I checked some of the plastic bags in my freezer and found that some bags have the label and some do not, but keep an eye out for it as it will increase in usage going forward. Q: Is cellophane recyclable? Is there _any_ recourse for styrofoam? A: See above section on plastic bags and film. #6 plastics (polystyrene and styrofoam) have very limited end markets and are not accepted in your city blue cart. Q: What about coffee bean bags which are a combination of aluminum and a strong plastic ? A: The “foil” coffee bags are multi-layered packaging are not recyclable. Products that have mixed materials can’t be separated in the recycling process. Q: I went to a neighborhood meeting about recycling and the guy said any of the plastic bags that you can push a hole in with your finger can be recycled at Target or grocery stores. That means you need to cut off the press and close strips on zip lock bags. A: Yes, the stretch test or “can you push a hole through it?” test are good ways to gauge if plastic bags and film are recyclable, but there are exceptions. Cereal bags, for example, are often recyclable but don’t really stretch, while food cling wrap (like Saran Wrap) does stretch but is not recyclable. Q: Cardboard to-go boxes lined with plastic (e.g. Broders, Whole Foods). A: Cardboard and paper to-go boxes lined with plastic or wax are NOT recyclable. Do not put these in your recycling cart. There are some paper to-go boxes out there that are compostable and therefore can go in your green organics cart. They MUST be labeled as BPI or Cedar Grove certified-compostable. Q: Almond/nut containers (tin, paper, plastic). A: Opt for nuts in metal or plastic containers with a lid, or a cardboard can as these containers can be recycled in your curbside bin. Soft plastic pouches are NOT recyclable. Q: Metal lids from glass jars like salsa? A: Metal lids from glass food jars such as salsa and pasta sauce that are fairly large, 3 inches diameter or larger, can be recycled in your curbside bin. Magnets are used to sort metal recycling, so if you have lids smaller than 3 inches and they are tin, you can put them in a tin can and scrunch the top so they don’t fall out and contaminate other recyclables. A: Plastic caps should be placed securely back on plastic bottles before placing in your bin. Also, be sure bottles and containers are empty (no liquid and no food) before placing them in your recycling cart. Items do not need to be perfectly clean, but as clean and dry as possible to reduce contamination. Q: Aluminum foil is supposedly recyclable, but is that only foil that is free from food? Similar to cardboard? How about the foil atop yogurt tubs? Is that foil? A: Aluminum foil is recyclable if relatively clean and dry. It should be collected and balled up, and the “ball” should be bigger than a golf ball before you put it in your curbside bin or else it will be too small to make it through the sorting process at the facility. Foil on yogurt, sour cream, cream cheese, etc. containers is typically lined with a thin layer of plastic and is not recyclable. Please throw it away in your trash. Q: Similarly, for cardboard: if I have a pizza box with one oil stain in a corner, should I cut the corner out, recycle the unsoiled part and compost the soiled part? A: Yes, place any unsoiled parts of cardboard pizza boxes in your curbside blue cart. Any soiled cardboard can be placed in your green organics cart for composting. Q: Does anyone know why black plastic and clamshells can no longer by recycled? A: The demand for black plastic is low and therefore there is no accessible end market for this plastic. Plastic clamshells for fruit and other produce are recyclable except for those with a #6 or #7 (most often on those used for deli or baked goods). Q: Should I be peeling the paper labels off of soup cans, or the plastic labels around peanut butter jars, or the stickers on milk cartons? Should I leave the metal twist top on the glass jar that the jam came in or should I take it off? Should milk caps stay on? A: It is ok to leave labels and stickers on cans, jars, and milk cartons. Metal caps should be left off glass jars (and recycled if over 3” in diameter). Milk caps should stay (securely) on plastic jugs and paper cartons. Q: If a clear plastic container has a 1 mark is it recyclable? A: Yes, #1 plastics are recyclable. The most common #1 plastics are plastic bottles (water, soft drink, juice, mouthwash, salad dressing), peanut butter jars, and detergent and cleaner containers. They should be empty and plastic lids should be left on. Q: Chobani single serve yogurt containers. What about their covers? A: Single serve yogurt containers are typically #5 or #6 plastics. #5 plastic yogurt containers are recyclable but should be rinsed before placing in your cart. #6 plastic yogurt containers are NOT recyclable and should go in your trash. The flexible foil/plastic peel-off covers on single-serve yogurt containers are NOT recyclable and should go in the trash. Q: I wonder about the square milk jugs. At one time I heard that juice boxes could be recycled, soy milk cartons also. If milk cartons can be recycled, do I take off the plastic cap? A: I assume you are referring to the square ½ gallon cartons that milk, juice, and nut/alternative “milk” come in. Yes, these are recyclable. Rinse thoroughly and put plastic cap back on before placing in your cart. Juice boxes are also recyclable, but please remove and throw away the straw before placing in your cart. Juice pouches, like Capri Sun, are NOT recyclable. Q: Do glass bottles, such as cooking oils, salad dressings, ketchup, etc. need to be cleaned thoroughly? A: Glass bottles should be empty and rinsed thoroughly, but it is ok if they are not perfectly clean and there is some oil/food residue left. Q: As a mom, I’d love something with images so my kids can help to ensure they’re putting the correct items in the correct bins. A: The City of Minneapolis sends out a comprehensive recycling guide every year. It includes pictures and descriptions of what you can and can’t put in your blue curbside bin. Hang it or store it in a place near where you collect recyclables inside your home. This information is also on the city’s Solid Waste & Recycling website and there is a phone number and email address if you’d like to request recycling stickers with pictures for your bins. A: Items that are commonly put in curbside bins that are NOT recyclable (aka contaminants) include plastic bags, paper and polystyrene egg cartons, black plastic containers, single-use plastic silverware and straws, plastic #6 cups (like many red SOLO cups), and single-use plastic-lined paper coffee and soda cups, like those at fast food restaurants. None of these items are recyclable in your curbside bin. Please do not put them in your blue cart. Q: A comprehensive list* of plastics: Tofu tubs with some of the thin plastic still attached? Clamshell containers that berries and tomatoes come in? The plastic packaging that holds the product to a cardboard backer? Etc. A: As a general rule, #3, #6, #7 plastics, and any black plastics, are not recyclable and should not be put in your city blue cart. Tofu plastic containers are typically a #5 plastic and therefore recyclable in your curbside cart. The thin plastic cover should be removed and thrown in the trash. Clamshell containers that hold berries and other produce are recyclable as long as they don’t have a #3, #6, or #7 resin code on them. The plastic packaging that holds the product to a cardboard backer is not recyclable in your city cart. The City of Minneapolis mails out a comprehensive list of recyclable plastics and other recyclable items every year. Keep it in near the spot you collect recyclables in your home or refer to their online guide. *Learn more about plastics and what the numbers (resin identification codes) on the bottom mean here. Q: I’d love an easy list of the ‘easily forgotten’ recyclables vs ‘commonly mis-recycled’ items. Q: I’m a very enthusiastic recycler & would like to know what mistakes to avoid, including the common ones that lots of us make AND the ones that really wreak havoc on the system. A: Refer to your City of Minneapoils Solid Waste & Recycling guide for a comprehensive list of what can be placed in or next to your blue cart for recycling. The guide also lists items that can be recycled if brought to a drop-off site, e.g. textiles and tires. Also, remember that liquids and food left inside recyclable bottles and containers spill out when recyclables are collected and transported. This can contaminate other recyclables and creates a smelly mess for employees at the materials recycling facility. Q: Are there any consequences for those who don’t comply with recycling instructions? I see violations all the time, in the neighborhood, at work, in public. Last week, someone put an open half-full cup of coffee in the bin with cans and plastic beverage bottles. Where did that person think the liquid was going to go? Oh yea, they didn’t think. Grrr. Unacceptable recycling, items that are non-recyclable or are contaminated, will not be collected and the offending cart will be marked with a recycling educational tag. 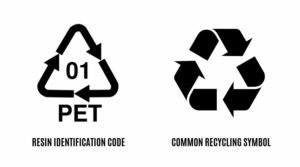 If you find a tag, please read it over to understand what the issue with the recycling is, correct the problem, and place your recycling out on your next recycling day. If this happens repeatedly, eventually your recycling cart will be removed by the city. If it is removed, you must wait 3 months to call the city Solid Waste department and request to have it returned at no charge. You can request it back earlier than 3 months, but there will be a $15 fee. Minneapolis residents with curbside collection may place a mattress next to their garbage cart on recycling week only. Please post a sign or write on the item ‘For Solid Waste.’ It will typically be picked up on the next business day after recycling day. The city recycles traditional mattresses, foam mattresses, and box springs through Second Chance Recycling. Q: In addition to no #6 plastics, I was told by Mpls Recycling that #3 was also not desirable. Plastic #3: Polyvinyl Chloride (PVC) PVC plastic can be rigid or flexible, and is commonly found in bags for bedding, shrink wrap, deli and meat wrap, plastic toys, table cloths and blister packs used to store medications. PVC contains toxic chemicals including DEHP, a type of phthalate used as a plastics softener. Plastic #6: Better known as polystyrene or Styrofoam, No. 6 plastics are found in disposable plates and cups, meat trays, egg cartons, carry-out containers, aspirin bottles and compact disc cases. Sign up for recycling reminders and tips: http://www.minneapolismn.gov/solid-waste/recycling/WCMSP-171152. Thank you for all of your questions and for taking the time to recycle right! What does the city do with the Organics they collect? Do they actually do something with it or does it go to a landfill? Minneapolis organics recycling does NOT end up in a landfill. It is collected and delivered to a facility in Rosemount that mixes the organics waste with yard waste to create a nutrient-rich soil amendment for use in gardens, landscaping, and even road construction. The process takes 6 months to a year to complete and involves a lot of mixing and temperature reading to ensure the resulting compost is of high quality. This compost is then made available to the public to purchase for use in their own landscaping and gardens and around 600 cubic yards of compost is given back to the city of Minneapolis each year for use in parks and community gardens. 1. Waste reduction. A 2016 study by Hennepin County found that organics make up around 25% of our garbage so organics recycling is a relatively easy and very important way to reduce the amount of trash we produce. 2. Greenhouse Gas Reduction. Organics that end up in landfills generate methane, a potent greenhouse gas. Diverting organics to composting helps to reduce landfill methane emissions. 3. Water Quality and Conservation. When nutrient-rich compost is added to soil, it reduces the need for fertilizers and pesticides. It also increases the water retention of soil, which reduces runoff and erosion that can pollute our water and helps to conserve water. Like all recycling, there are rules to follow with organics recycling to ensure that the resulting collection is not contaminated. You can access the guidelines here. If you have any questions about organic recycling the city has helpful information here. And if you would like to purchase compost made using the organics the city collects you can buy it here. I have gotten several ads for solar energy/joining on a solar energy grid. Not sure how it works, or if it’s a scam. Anybody using? Would love to participate if it helps save energy, and if it’s legit too, of course. I have heard this question asked by several neighbors and am guessing many others are wondering the same thing. The advertisements you are getting are likely asking you to subscribe to a Community Solar Garden. Several years back this new product took shape in Minnesota as a way for residents and businesses to invest in and “use” solar energy without installing panels on their own roof. It works kind of like subscribing to a CSA, where you sign up to get a certain amount of vegetables from a local farmer. With Community Solar Gardens, you subscribe to a certain amount of energy from the solar developer’s “garden” based on the amount of electricity your home (or business) uses. The exact electrons from that solar garden don’t go into your home, they go into Xcel’s electricity grid that powers our city, but you are offsetting your home’s usage with solar. The solar garden itself may be located anywhere in the same or adjacent county to your home. Although some solar gardens will be on urban rooftops, most will be in rural fields due to economies of scale from the large fields, and difficulty in finding urban buildings to host. When you subscribe, you pay the solar developer for your subscription and Xcel Energy reimburses you for the energy your subscription produces. This reimbursement comes in the form of a credit on your Xcel Energy bill. Why has this product become so popular? In addition to the environmental benefits, it can offer projected financial savings for the subscriber. Part of the projected savings comes from a government credit that makes your solar energy worth slightly more than conventional non-renewable energy. Another part of your projected savings may come from the ability to lock into a subscription rate structure that is expected to be better than future energy costs, saving you money over time. When considering participating, you should evaluate the savings projections to see if you agree with them and are comfortable with the terms. It’s also important that the language in the contract aligns with what you’ve been told. If a salesperson uses high-pressure tactics, that could be a red flag; you should be allowed time to read the subscription contract before signing. The thing that gives most people pause is that subscriptions are typically for 25 years. Nearly everyone says, “I don’t know where I’ll be in 25 years”. Solar developers know that and will include language in the subscription contract about what happens if you need to exit your subscription early. You’ll want to pay attention to the early termination terms. In answer to your question about whether these are “legit”, yes as a product they are legit. But, contract terms and sales methods will vary from one developer to another. Below are some key variables to pay attention to in a subscription contract (of course you’ll want to read the full contract before signing). Move and become ineligible for your subscription (note: you can likely transfer your subscription to a new home if it’s in the same same or adjacent county to the solar garden). The idea is that while you hopefully benefit financially, you are also offsetting your electricity with clean, renewable energy. For more information, the MN Department of Commerce has some guidance on their website. The holidays generate so much garbage! What can be recycled and what are some ways I can cut down on generating so much waste? This is a timely and important question! From leftovers that don’t get eaten, to the large garbage bags filled with wrapping and packaging, holidays do indeed generate a lot of waste. Thanks to the internet and social media, there are abundant resources on how to have a meaningful holiday of giving without all of the garbage and waste. All of these ideas have one thing in common–reduction. Gift experiences, not things. Theater or game tickets, activity passes, online subscriptions, and memberships to museums are meaningful, thoughtful, and personal. Last year I gave my son a membership to a climbing gym. Not only did he love it, but it was a great way to burn the energy of a tween boy in the cold winter months! One of my own favorite gifts from a few years ago was a pottery workshop at Northern Clay Center. When gifting things, choose gifts with little to no packaging. If packaged, choose packaging that is easily recycled like cardboard and paperbox board. And don’t forget your reusable bags when you’re out shopping–they’re not just for groceries! In addition, scrap the traditional wrapping paper and tissue which often contain mixed materials (like glitter and foil) and therefore are not able to be recycled. Instead, use wrapping that is sustainable and reusable, such as sturdy gift bags, old maps and newspapers, or a reusable decorative cloth and ribbon (pictured here). Find inspiration on Instagram by searching for the hashtags #scrapthewrap and #furoshiki. Learn the unique art of Furoshiki gift wrapping on YouTube. Reduce food waste by planning ahead. Share a menu with your guests and have a sign up for those who are bringing food to avoid duplicates or too much of something. Communicate a head count to everyone contributing and use a portion planning calculator like savethefood.com to help figure out how much food is really needed, including just the right amount of delicious leftovers. It’s good for the planet, your wallet, and your waistline. Use reusable plates, silverware, glassware, and serverware. Ask a few guests to bring silverware, plates, and glasses instead of food. Rent dishes and glassware from a local party rental shop. If you have to use disposable, choose BPI- or Cedar Grove-certified compostable and place them in your Minneapolis curbside organics bin for collection. Have a wonderful, warm, and waste-free holiday!